Don Bokhart, left, and Rob Fisher of the Wawasee school board. 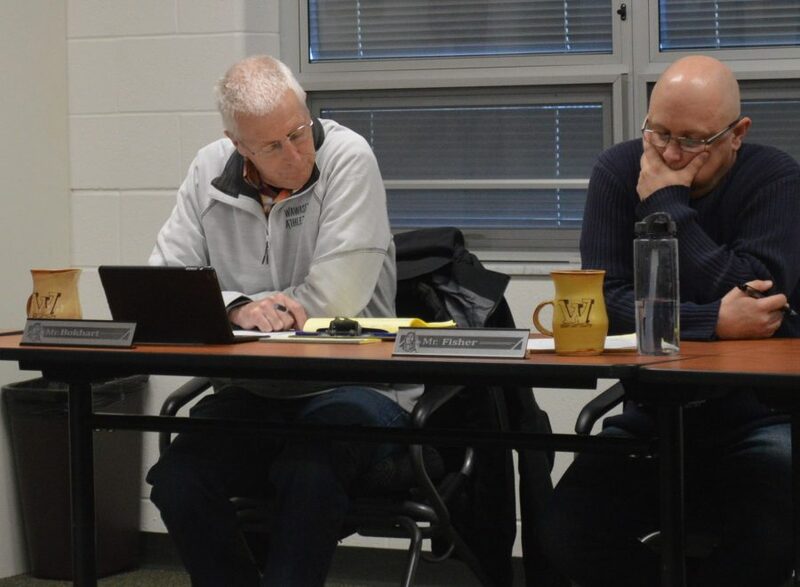 SYRACUSE — Eric Speicher, Syracuse Elementary School principal, continued a series of school improvement plan reports during the regular monthly meeting of the Wawasee school board Tuesday evening, March 13, in Syracuse. Speicher noted the school is using a new math curriculum, LearnZillion, and admitted it has been challenging for teachers, students and parents. “There has definitely been a learning curve,” he said, adding it has meant no longer using textbooks or paper and now doing everything online. But progress is being made, he said. Teachers are more familiar with the reading curriculum that has been used for several years and the school has a strong Title I program where students get help with their reading skills. “They (students) get some pretty intense daily intervention,” Speicher said. Having a full-time technology staff member has helped significantly and this year there have been fewer broken devices. Social and emotional support is also being addressed and 19 students have Bowen Center behavior coaches, 13 students are getting counseling services, 17 have a lunch buddy who visits them to have lunch at school and other students are getting individualized attention. Moving into a new building posed significant challenges, particularly early in the school year, but things are running more smoothly now. Speicher particularly noted the amount of time it takes to get students out the door and picked up by parents has decreased from about 45 minutes earlier in the year about 15 minutes now. Two Syracuse Elementary third grade students, Reese Beasley and Charlotte Kompagne, gave a presentation on their project to collect box tops in order to raise funds for the school. A container was put in the Lakeland Youth Center preschool to collect box tops. The students were able to collect and count 5,731 box tops, meaning $573.10 was raised for the school. Park went on to say some of the parents felt they were not being heard and only those with complaints about Robinson were being listened to. But Kim Nguyen, high school principal, said he has heard from an equal number of people, for and against Robinson, and encouraged those at the meeting to speak with him and share their concerns. Park noted one of the complaints he had heard was Robinson only spends time coaching a select few members of the swim teams. But several parents said at the meeting Robinson has shown she is willing to work with many of the swimmers and they have never been given the impression she is not willing to help anyone who asks. Rebecca Linnemeier, school board president, said the board does not hire or fire teachers or coaches and encouraged the parents to set up a meeting with Nguyen and Cory Schutz, athletic director. “This is not the proper forum for this,” Linnemeier noted. In other business, during his report to the board, Dr. Tom Edington, superintendent, said a bill is currently being considered by the Indiana General Assembly that would require students to have parental permission before taking human sexuality courses. Presently an opt out provision exists, which Edington would like to see remain, allowing parents to contact the principal if they don’t want their child to be taught certain portions of the course and instead want to teach them at home. Also during his report, Edington noted school districts in Gary and Muncie have been taken over by the state due to extreme financial difficulties and Ball State is appointing a new school board in the Muncie district.